This post is the second installment of a five-part series, chronicling Mr. Rickbeil's educational trip (and much needed vacation) to Finland this past summer. Being from Minnesota, I understand stress. Life in Minnesota has plenty of stresses, including snow in April (and occasionally May), tater tot hotdish, frequent summer road construction, more frequent summer mosquitoes, and weeks in a row where the temperature never tops 30 degrees. Additionally, we have some strange rituals in Minnesota designed to reduce stress that actually seem to create more stress such as ice fishing, camping with the mosquitoes, and watching the Minnesota Vikings. Growing up prepared me for strange forms of stress and recreation, but nothing could have prepared me for the Finnish version of recreation. In Finland, the national recreation obsession is the sauna, and they are everywhere in Finland. They are in the vast majority of the hotels, apartment complexes, and individual homes. They are in summer cottages on lakes and larger vacation homes beside the Baltic Sea. If you are ever lucky enough to take a boat tour around Helsinki, you will find an endless supply of houses with an equally endless supply of saunas. In fact, most of the saunas are built to resemble the houses they are next to, with the same color roofs and paneling. Staying in hotels, I had plenty of opportunities to visit a sauna, although the hotel saunas are supposedly not as authentic as the municipal ones. On one of my days in Finland, I paid a visit to a public sauna next to the large lake on the North end of the city I was staying in. 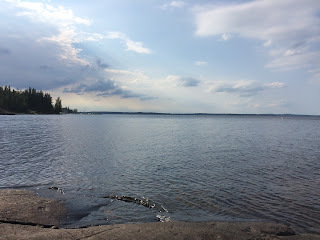 I was suffering with the jitters from a rather strong cup of coffee (another Finnish tradition), so visiting the Sauna in the early evening seemed to be a good idea to relax. I had no idea what I was in for. The sauna experience begins with a plunge into the lake. In fact, most summer cottages usually place their sauna a few steps away from the waterfront for this convenience. However, this lake was nothing like Chesapeake Bay. In fact it was a frigid 55 degrees, which seems out of place anywhere in the middle of August. 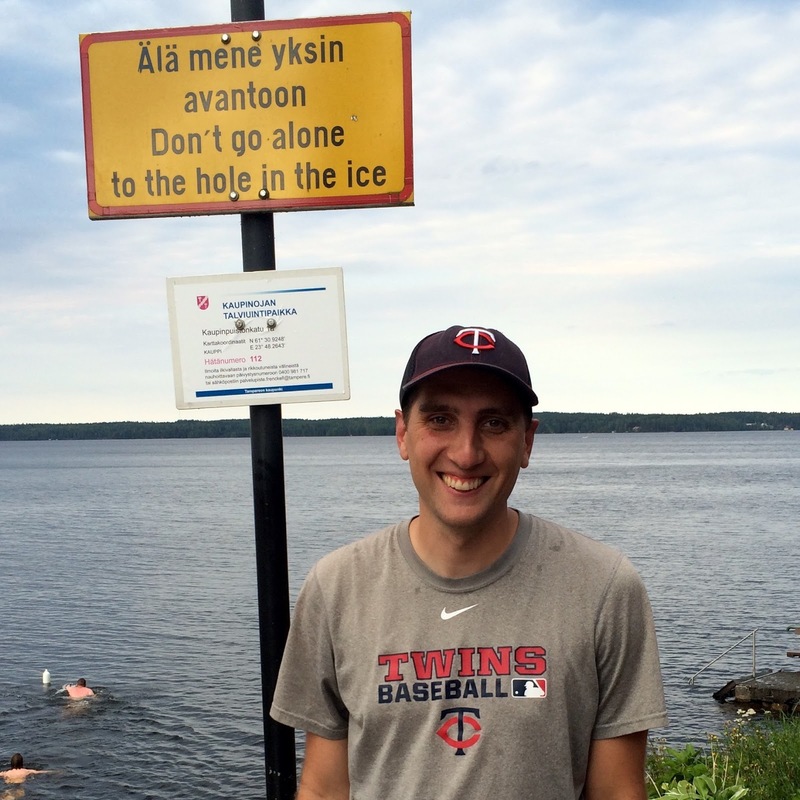 Although I have plunged in a few Polar Bear plunges, the cold water was a shock to my system, and I immediately began gasping for breath in the water while the native Finns around me chuckled to themselves. After a short one or two-minute swim, I made a mad dash out of the water and into the sauna itself. This was the other side of the story. The sauna building was a toasty 185 degrees, which was not even the warmest sauna I visited during my stay. The first few minutes are comfortable, taking away the cold blast of the water. The next few minutes make you sweat. The next few minutes make your ears and eyes feel like spaghetti that is softening up in a boiling pot of water. When someone pours a ladle-full of water on to the rocks in the sauna, a pleasant steam rises and fills the entire room- until a minute later, when you realize that same steam is giving your face and ears the sensation that they are melting. This was the first cool dip and toast. I repeated this pattern about 12 times over the next two hours. The first few plunges seemed masochistic, but something strange happened the more I entered the water and the sauna. I started getting used to it, as each plunge seemed a little less frigid and each toast seemed a little more tolerable. My body had actually adapted to the sauna experience, and I found myself enjoying the experience more and more. The Finnish people swear by the saunas, and it did not take me long to understand why. The constant ups and downs in my heart rate left me feeling completely relaxed after the two hour experience. My body felt like it had run a five-mile race, even though I spent most of the time sitting still in the steam. The Finnish people swear that saunas help them to reduce their stress, sleep better, live longer, and fight off disease. Finnish people celebrate saunas with their families, with honored guests, and even to finalize business agreements. They are the essential cultural experience of Finland, and I can see how the toasty sauna must be a relief during a long, cold winter. I miss the sauna, and wish I could put a public sauna with a cold lake right here in Ellicott City. But the point that my sauna experience really drove home was the importance of having a plan for stress. In Finland, frequent saunas a good way to handle the stresses of life. I may not have a local sauna, but I need to plan for the stress that is a routine part of life. I need to make time to run, work out, and play pick-up basketball. I also need a daily prayer routine, regular time with my friends, and a few hours each week with the Minnesota Vikings, even if the latter may actually increase said stress. The beginning of the school year is an especially stressful time, and it does not take long on campus to feel the stress and anxiety that come with the anticipation of everything coming in the new school year. As a family, I encourage you to plan for the stresses that will be coming your way this year. Make a plan of when you will play together, exercise together, or do things you enjoy together that will help you manage the stress in your life. You might not find yourself cooking in a Finnish sauna, but planning for the stresses that are coming will help you thrive in the midst of them. Learn from the Finns - "the traditional sauna experience begins with a Polar Bear plunge into a cold lake. The winter is the best time for this. You can cut out a hole in the ice. Then, you rush into the hot sauna to sweat out any impurities found in your body. Learn from the Finns!